A Union Pacific freight train passes through Uptown Normal. Normal residents and Illinois State University students are putting their lives at risk to get around stopped freight trains in Uptown. Despite concerns reported to the freight operator, it could take a while to see a change in train traffic. Town of Normal Director of Public Works Wayne Aldrich verified the increase in stopped trains. He said it is a result of Union Pacific Railroad using the Bloomington yard more extensively for switching and swapping train cars. The town has expressed its concerns, including safety issues with residents attempting to pass in between or under stopped train cars, he said. But Union Pacific has no current plans to change operations. “They appreciate our concerns, although they did not commit to changing this operations plan, they said that they would be looking at efficiencies and trying to get these outages minimized as much as possible,” Aldrich said. 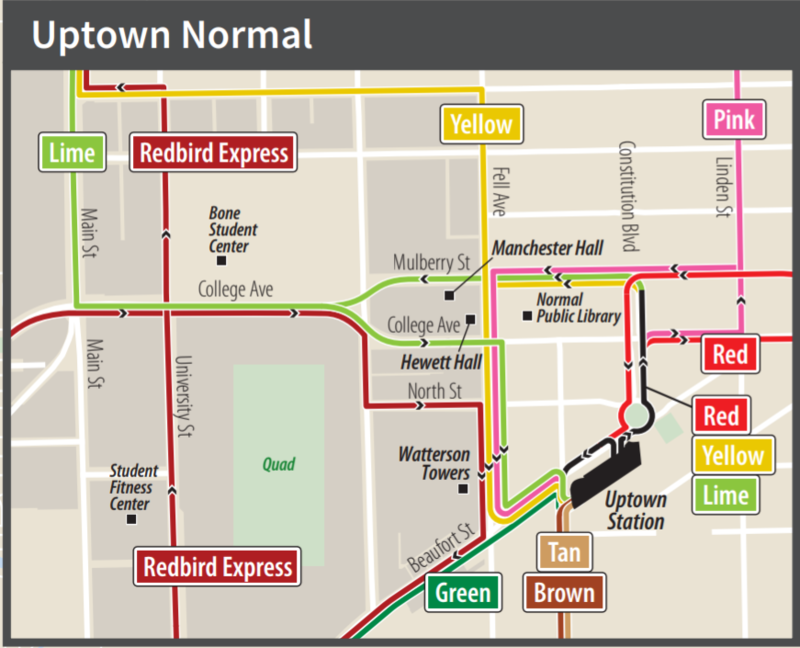 Connect Transit has prepared alternate routes for the Brown and Tan lines should there be a train stopped on the tracks in Uptown Normal. The trains are also causing Connect Transit to alter certain bus routes. Aldrich said he is working with Connect Transit, which made alternate route plans for the Brown and Tan lines when trains are stopped on the tracks. He plans to check in with Union Pacific next week on its progress in improving work at the Bloomington yard. There is no schedule for when these trains will interrupt normal traffic flow. But as a temporary solution, Aldrich said social media can be used as a tool to spread the word when there is an obstruction. But his primary concern is pedestrian safety. “Certainly don’t attempt to cross a train, whether it’s stopped or moving, whatever, don’t do that,” Aldrich said. He said things that can be done in the meantime include bettering communications with students and residents on the dangers of crossing the tracks while a train is stopped. The town is working directly with ISU on different ways they can better communicate or enforce rail crossing rules. Regarding temporary solutions, Aldrich advised to plan to cross at unblocked intersections such as the School Street and Main Street underpasses. The new year will be a bit quieter for Normal residents who live near the train tracks. The Town of Normal is ready to move forward with a $29.2 million development it says is right in line with a vision for Uptown laid out nearly two decades ago.